Drafting a Form S-1 is a critical step in the initial public offering (“IPO”) process that requires significant man hours, attention to detail, and collaboration between many parties to complete successfully. A Form S-1, commonly referred to as the “Prospectus” or simply the “S-1,” is the official Securities and Exchange Commission (“SEC”) document your company must file to register its securities with the SEC. Registering securities with the SEC enables a company to offer its securities to the public in an IPO. A well-drafted S-1 provides a detailed description of the issuing company and its securities offering and complies with the SEC S-1 guidelines. What is found in an S-1? An S-1 is made up of various sections that each provide unique information to potential investors and the SEC. Each section has a specific purpose and contains useful information about the company and the offering. The following paragraphs provide a detailed discussion of the required S-1 sections. The Prospectus Summary is arguably the most important section of an S-1 as it is the section that is read by the broadest audience; in fact, it is often the only section investors read. The Prospectus Summary highlights the information found in the S-1 but is not meant to be a standalone document that tells an investor everything they need to know to make informed investment decisions. As such, each S-1 begins with a statement explaining that the prospectus summary does not contain all the information investors should consider before investing in a company’s stock and that investors should read the entire prospectus carefully before making any decisions. For example, the Prospectus Summary of Snap, Inc.’s S-1 stated, “This summary does not contain all of the information you should consider before investing in our Class A common stock. You should read this entire prospectus carefully, including ‘Risk Factors,’ ‘Management’s Discussion and Analysis of Financial Condition and Results of Operations,’ and our consolidated financial statements and the related notes included elsewhere in this prospectus, before making an investment decision.” This statement is meant to shield your company from any liability related to the impact of information not found in the Prospectus Summary. The Prospectus Summary also includes a description of your company. This description is an opportunity for you to explain your company’s mission statement and what makes your company unique and successful. Following the mission statement, you may discuss your company’s strengths, strategy, objectives, and operations to convince readers to invest in your offering. In the Prospectus Summary, you also need to include a list of primary risk factors investors should consider. 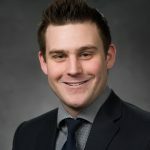 The risk factors found in the Prospectus Summary do not require a robust explanation because the Risk Factors Section of the S-1 below provides a more comprehensive and detailed discussion of applicable risks. This section also states the dollar amount your company expects to raise in the offering (these numbers are usually left blank until the Company is very close to the pricing) along with how the company intends to use the proceeds. You should also disclose the voting rights associated with each class of stock and what voting percentage the founders and existing stockholders will have after the offering. The final element of the Prospectus Summary is the Summary Consolidated Financial Data. The Summary Consolidated Financial Data includes consolidated statements of income (or operations) and consolidated balance sheet data. These statements generally include most of the information the full financial statements include; however, certain line items may be combined and presented in aggregate. It is important to note that the summary financial data usually presents the previous three years of financial data unless your company qualifies as an Emerging Growth Company (“EGC”) under the Jumpstart our Business Startups (“JOBS”) act (See our article The JOBS Act for more information). According to Title I of the JOBS act, a company qualifies as an ECG if it had less than $1 billion in gross revenues during its most recent fiscal year. If you qualify as an EGC, you are only required to publish financial data for the two previous years. Following the most recent fiscal year’s balance sheet data are two additional columns labeled “pro forma” and “pro forma as adjusted”. The “pro forma” column is an estimate of each account in the balance sheet as a result of financial events that will occur because of the IPO, such as conversion of preferred stock to common stock or the exercise of options triggered by the IPO; however, the “pro forma” column does not reflect the affect of the proceeds from the offering. The “pro forma as adjusted” column adds the effects of the net proceeds from the offering to the “pro forma” data. In this section, state that the prospectus includes forward-looking statements and these statements are formed using expectations of future outcomes. Explain that because the forward-looking statements are formed using expectations of the future, they are best estimates as to what will happen and not expected to be a demonstration of certain outcomes. You should also discuss that the forward-looking statements are subject to change due to certain events and risk factors, including those described in the Risk Factors section, but you will not adjust the forward-looking statements to reflect actual future results after the date of the prospectus. In practice, most companies use nearly identical language for this section. The Industry Data section explains that the prospectus includes estimates and information concerning the industry your company operates in, and this information is based on third party industry reports that you have not independently verified. This section cautions investors not to give undue weight to these estimates as the information found in reports may differ from reality. You also introduce the various metrics your company uses to measure success, such as daily active users or average revenue per customer, and explain how you calculate those metrics. In this section, discuss whether or not your company expects to pay any cash dividends in the foreseeable future or if it intends to retain its earnings. In the Capitalization section, disclose in tabular form the amount of cash, cash equivalents, and marketable securities you have and your capitalization (the amount of debt and equity your company has on its books). The capitalization table displays your company’s actual debt and equity figures, disaggregated into the different debt holders and classes of stock. The table also includes “pro forma” and “pro forma as adjusted” figures (as defined in the prospectus summary section). The Dilution section explains to investors that if they invest in the common stock you are offering, their interest will be diluted by the difference between the price they purchased their shares at and the actual value of the company’s tangible assets attributable to each share immediately following the offering. This means that although investors will purchase your stock at one price, the book value per share associated with those shares will be less than their initial purchase price, even after the effects of events triggered by the IPO like the conversion of stock, the exercising of options, and the receipt of proceeds from the offering. The dilution is not a measure of decrease in the market value of investors’ stock, rather it shows the difference between the market value of a share and the book value of a share immediately after the offering occurs. An example of this is shown in the example found in Figure 1. According to SEC publication S-K 229.301 “The purpose of the selected financial data shall be to supply in a convenient and readable format selected financial data which highlight certain significant trends in [your company’s] financial condition and results of operations.” You generally need to present the previous five years of financial data; if your company qualifies as an EGC under the JOBS act, you can present just two years of financial data. The following items must be included in the financial data: “net sales or operating revenues, income (loss) from continuing operations, income (loss) from continuing operations per common share, total assets, long-term obligations and redeemable preferred stock…, and cash dividends declared per common share” (S-K 229.301). While not required, it is recommended you include any other financial data you feel enhances or clarifies any important facts regarding your company’s financial position, operations, or trends. You should also briefly describe important factors such as accounting changes, business combinations, or dispositions of business operations that materially affect the information in the selected financial data. 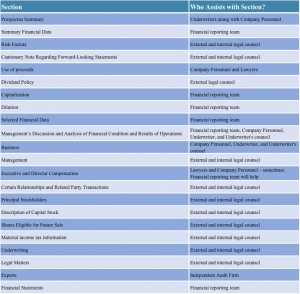 The Management’s Discussion and Analysis of Financial Condition and Results of Operations (“MD&A”) section, in conjunction with the Selected Consolidated Financial Data section above, is another important section of the prospectus; it allows readers to understand (1) what data in the financial statements management considers important and (2) what additional information management wants to highlight to investors. Per SEC publication S-K 229.303, the MD&A section must discuss and disclose the following items at a minimum: liquidity, capital resources, results of operations, off-balance sheet arrangements1, and contractual obligations. The MD&A section may also include any additional discussions management feels will help investors further understand the significant operations, financial positions, or trends of the company. The following paragraphs outline the required discussions and additional discussions commonly found in the MD&A. Liquidity & Capital Resources. The SEC allows companies to combine the liquidity and capital resources portion of the MD&A section whenever the two topics are interrelated. Use the liquidity and capital resources discussion to identify any commitments, trends, or events that will lead to a material change in your company’s liquidity. The discussion of liquidity usually begins by explaining the company’s main sources of liquidity and the primary use of cash from those sources. Management also details any significant borrowing agreements the company has with its major lenders. Management also provides a summary of the company’s cash flows, which presents the company’s net cash from operating, investing, and financing activities and a detailed discussion of the cash used or provided by each of the three types of activities. Results of Operations. The results of operations discussion must describe and disclose the following at a minimum: unexpected or unusual events or transactions that materially affected your company’s income; trends or uncertainties your company expects to materially affect income; reasons for material changes in net sales, if any; and changes in sales and income resulting from inflation and price changes. The results of operations discussion may begin with a statement of income, summarizing your company’s operations over your company’s required presentation period. Following that discussion, explain the reasons for any significant changes in income statement line items. Most companies do this by discussing each line item individually, including a discussion of any significant changes that occurred between periods. Almost every MD&A section will have a discussion of the quarterly results of operations, this will present quarterly operation tables and elaborate on significant quarterly trends. Off-Balance Sheet Arrangements. The off-balance sheet arrangements portion of the MD&A is where you identify and disclose any off-balance sheet arrangements your company has, including the nature and financial impact of each arrangement. If your company has no off-balance sheet arrangements, state that the company has none. Contractual Obligations. Some contractual obligations must be disclosed in the MD&A. These obligations are presented in tabular form and state all information as of the end of the latest fiscal year. The obligation classes required in the MD&A are long-term debt obligations, capital lease obligations, operating lease obligations, purchase obligations, and other long-term liabilities reflected on the balance sheet. 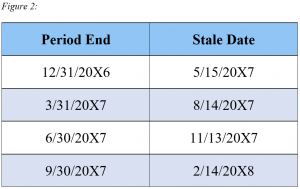 In addition to the total value of each class, the table must disaggregate each obligation class into amounts due within one year, due between one and three years, due between three and five years, and due in more than five years, as shown in Figure 3. Following the table, include any details that are important for investors to know regarding the company’s contractual obligations, including any significant changes since the most recent year-end table presented. In addition to the topics required by the SEC in the MD&A section, many companies include discussions of trends and other factors affecting their business, assessing business performance, critical accounting policies and estimates, and disclosures about market risk. Assessing Business Performance. Another important insight readers gain from the MD&A is how management assesses the performance of the business. This discussion is important because investors need to understand and trust the methods you use to assess performance. 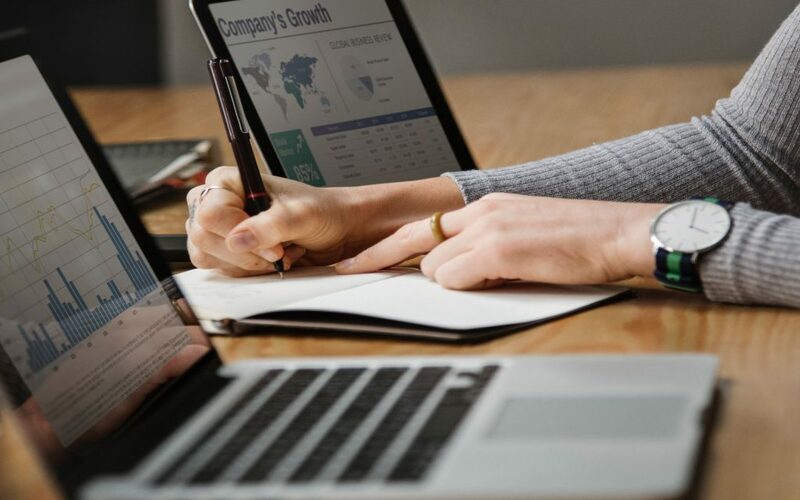 Summarize the various financial and non-financial metrics used to evaluate your company; these often include both company-agnostic metrics, like EBITDA or gross profit, and company-specific metrics, like occupancy for a hotel or daily active users for an app. Trends and Other Factors. In the trends and other factors discussion, you may address select significant factors or trends that have already impacted or may impact your company’s revenues and expenses. Outline the major sources of revenues and expenses first, and then identify factors that currently affect or could affect those sources. The factors may be broad, such as changes in consumer demand and global economic conditions, or company-specific, such as your new rebranding initiative and the impact you expect the rebranding to have. While it is important to discuss significant factors, including ones that may affect every company, much of the value in the MD&A comes from management informing investors of company-specific factors or trends investors might not learn from any other source. Critical Accounting Policies and Estimates. Explain that management must exercise professional judgment to make estimates and assumptions when preparing financial statements in accordance with U.S. GAAP. Also disclose that the estimates and assumptions may materially affect the financial data the company reports. Identify the specific accounting areas for which management has made estimates or certain accounting policy decisions, and explain the accounting impact of those estimates and decisions. Some accounting areas often included in this section are goodwill impairment, consolidations, stock-based compensation, and revenue recognition. Market Risk disclosures. The quantitative and qualitative disclosures about market risk highlight your company’s susceptibility to inflation risk, interest rate risk, or foreign currency risk. These risks are not the same as those found in the Risk Factor section. The Management section lists all the names, ages, and positions of executive officers and non-employee directors (e.g. members of the board of directors). Indicate which directors are members of the audit committee, compensation committee, and governance committee. Companies often provide brief bios of each executive officer and board member, including their tenure with the company. Familial relationships between any of the board members or executive officers must be disclosed. Following the bios of management, discuss the composition of the board of directors, including a statement of director independence. Describe the purposes and members of the different committees, statements of the board’s code of business conduct and ethics, and board member compensation. Disclose the compensation for any named executive officers or employee directors. Include a table disclosing the employees’ base salary, bonus, options awarded, and all other compensation awarded to each officer or director in the most recent fiscal year (as shown in figure 4). Following the table is a detailed discussion and explanation of the specific compensation elements, the method of awarding each executive’s compensation, each employee’s employment agreement, the annual bonus plan, and the outstanding stock awards at the end of the fiscal year. Disclose and detail any transactions since the beginning of the last fiscal year, or any proposed transactions, exceeding $120,000 in which a related party has any material interest. You must disclose the name of the related party, the nature of the relationship, the related party’s interest in the transaction, the dollar value of the related party’s interest in the transaction, the dollar value of the transaction, the details of any debt agreements related to the transaction, and any other transactional information that may be material. Following the disclosure of all related party transactions, outline the company’s approval process for related party transactions. In this section, outline the major stockholders of your company. Include a table outlining the name of each stockholder, the number of shares they hold, the number of shares they are offering, and their ownership percentage after the offering if they will hold more than one percent of the total shares (Figure 5). Many companies also disclose other items in the table, such as the voting percentage of each stockholder, the number of shares each is selling, or the number and percentages of each class of stock they hold. In this section, disclose the number of shares outstanding your company will have after the IPO. State how many shares will be in each class of common stock after the IPO and how many shares were in each class at the end of the previous fiscal year. Next, discuss the features of each class of common stock including, but not limited to, voting rights, dividend rights, and terms of conversion. The same information must be disclosed for any preferred stock your company may have outstanding. In this section, outline the total number of future shares outstanding by class, explain how many shares will be available for sale in the future, and state when they will be available. Here you identify any lock-up agreements2 and discuss any laws that may prevent certain stockholders from selling their shares, such as SEC Rule 1443. This section is meant to be a warning to Non-U.S. investors that there could be certain tax consequences they should consider when investing in your stock, as different rules may apply to them when buying U.S. securities and when buying local securities. It is not meant to be professional tax advice, but rather a notice for potential foreign investors. In this section, provide the name of the law firm approving the shares of stock in the IPO and the name of the underwriters’ counsel. In this section, identify the registered public accounting firm that audited the financial information you have provided throughout the prospectus. Briefly explain that the information found in the prospectus does not contain all the information found in the registration statements or exhibits you have filed. Direct anyone who would like further information to the SEC and provide the appropriate contact information. After the working group is done drafting the Form S-1, it will be sent to the SEC for review. The SEC will either approve the S-1 or provide you with comments regarding what they would like you to change. Once those changes have been made, you will submit the amended S-1, often listed as an “S-1/A,” to the SEC and the comment process will begin again. It is important to note that the initial S-1 and subsequent amended S-1s may not include the offering share price or number or shares being offered until just before your company’s IPO date. For more detail on the SEC submission and comment process refer to The SEC Comment Process article. Who drafts each section of the S-1? Many members of the working group collaborate to draft the S-1, each taking responsibility for different sections. The following table gives a general overview of which members of the working group draft each section. Assets or liabilities that have a significant impact on a company’s operations but because of accounting rules are not shown on the balance sheet. Lock-up Agreement: a contract between previous owners and the company that prohibits the owners from selling their interests within a specified time period after an IPO. Usually the owners agree to not sell their shares for somewhere between 60 and 120 days post-IPO, though some lock-up agreements have had lock-up periods of as long as a year. SEC Rule 144: only allows the sale of restricted or control securities if a number of conditions are met.